As some may remember, the last Parliament took place in Salt Lake City in 2015, where significant Bahá’í contributions were made to the discourse, both in plenary sessions and in workshops. 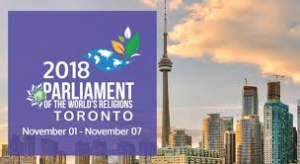 A number of proposals from individual Bahá’ís, acting as sole presenters or in partnership with Bahá’ís and those from the wider society, were accepted by the Parliament for workshop presentations. We are hoping that these excellent contributions to the 2015 Parliament can be replicated or surpassed this year. If you feel that you would like to contribute to this effort, please note that the deadline for applications is March 1, 2018. All applications can be submitted to the Parliament at https://parliamentofreligions.org/rfp. Hosting a reception for Parliament attendees at a restaurant or possibly at the Toronto Bahá’í Center. Having a booth or space at the Parliament. Handing out fliers. What audience should the Institute aim for? Encouraging Wilmette Institute faculty to register and make presentations. Using any existing Bahá’í space at the Parliament for a table with literature and/or a display. Please send ideas to Dr. Robert Stockman, Director of the Wilmette Institute at: rstockman@usbnc.org.